The Rogues are in a battle with the Crime Syndicate, the same group that took down the Justice League with barely a thought. This simply cannot end well…and that’s the premise that starts this issue of Rogues Rebellion. There are big changes everywhere in the DCU, none more evident than what happens in this story. Still, we see once again the qualities that have made the Rogues such a fan-favorite among DC villains in a true game-changing issue. The Rogues have been ordered to level Central City…something that goes against the Rogues’ code against killing. When you add to that the fact that Lisa is still in one of the hospitals in the Gem Cities you know the Rogues won’t comply. Besides, have they ever taken orders from anyone? There is one major plot point here that has been spoilered by Forever Evil, but just in case you haven’t read that we won’t give a further spoiler here – let’s just say that there is a MAJOR change for at least one Rogue that has big-time implications moving forward. What we do see is the battle between the Rogues and the Crime Syndicate in greater depth than we have previously read. The result changes so much for every member of the Rogues, and takes them to…a very interesting cliffhanger that sends them to unexpected places. Brian Buccellato has placed the Rogues in the toughest situation they’ve seen in the New 52, and really the worst situation they’ve been in since that mess with Neron in the old continuity. Still, he keeps the characters true to their most basic qualities, what makes them unique among DCU villains. Scott Hepburn’s illustrations (with colors from Nick Filardi) work very well with the Rogues, espcially dealing with some very critical scenes that will have major implications moving forward. It is a bit of a shame that one of the truly major moments for the Rogues was spoilered by another title, but it is still effectively dealt with in this issue. I’ll say this again…if only this was an ongoing instead of a mini-series. 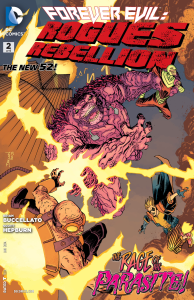 This entry was posted in Reviews and tagged Brian Buccellato, DC, Forever Evil, Nick Filardi, Rogues Rebellion, Rogues Rebellion #2, Scott Hepburn on November 22, 2013 by Ed Garrett. So maybe it’s because I read more Wally comics… But I like Walker as Trickster a lot better than Jesse. I’m really waiting to see somebody do something clever with his robo-arm. I want it to have some cool stuff built in: electrified yo yo launchers, flashbang cap guns, a rubber chicken! I dunno. I think that arm is rife with possibilities I want to see explored. Oh and I just picked up this issue. I really want a Rogues ongoing at this point. The noble bad guys standing up for the people in a sort of post apocalyptic setting is really engaging to me. Hopefully Cold and Mirror Master get their powers working right soon. Loved seeing Trickster use his rocket arm, loved the Arrow spoof, loved the writing on Power Ring. This series is awesome.